AMERICAN FOLK is a sweet little film. While it is saddled with a post 9/11 road trip plot, something that is quietly becoming an inde sub-genre, it manages to transcend it thanks to a winning cast, some stunning images and some great music. Director David Heinz manages to pull together his choice ingredients and make a film that manages to make something tired vital and alive. While there is much to like in the film the parts that worked best for me are the wordless ones. Watching the sequences where the country passes by or things happen while the wonderful score plays over them absolutely delighted me. Sometimes words get in the way, and when American Folk disposes of them the film soars. This isn’t to say the rest of the film is bad, it’s not, rather it is simply to say that the moments that I carried away from the film were the small ones, which in my memory became large ones. As with life some times it's the small moments that end up meaning most to us. 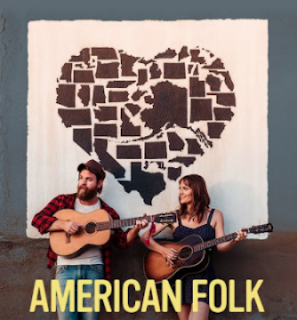 AMERICAN FOLK opens Friday in theaters and VOD and is recommended.